They are tiny prominent veins just below the skins surface spider veins can occur anywhere on the body but but most often on the legs and face. The exact causes of thread veins are not known but along with hereditary factors it is thought heat, alcohol and hormonal changes act as a trigger. How do we treat the spider vein? We remove thread veins with the use high frequency. You may feel a slight discomfort during the procedure but it can not be described as painful. 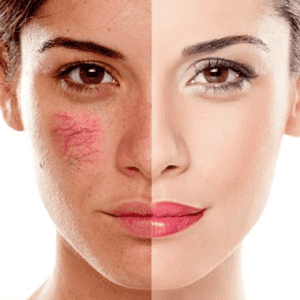 Radiofrequency uses heat to damage tissue which encourages scar tissue to form. The scar tissue closes the vein and the small vein is absorbed into the body. Do the veins disappear straight away? Yes, however you may require more than 1 treatment session to treat all of your veins. Following your treatment normal activities can be resumed and it is commonly described as a walk-in walk-out procedure.